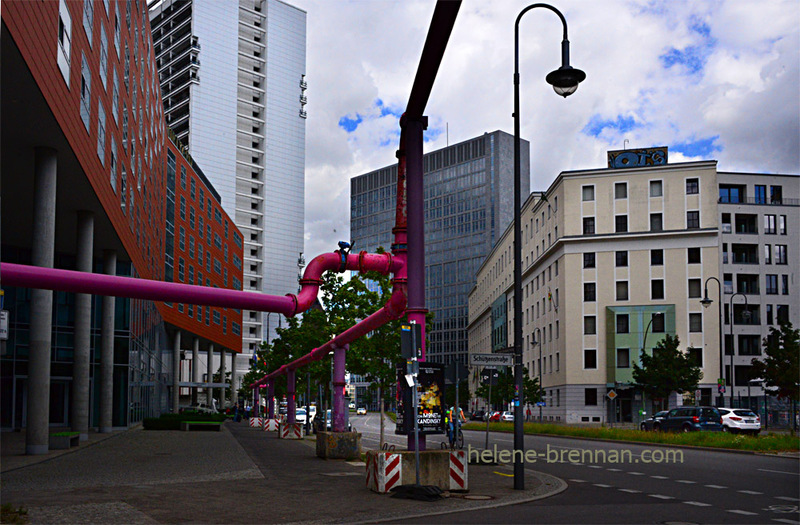 BERLIN 4, Some More of the Arty, Creative and Unusual. 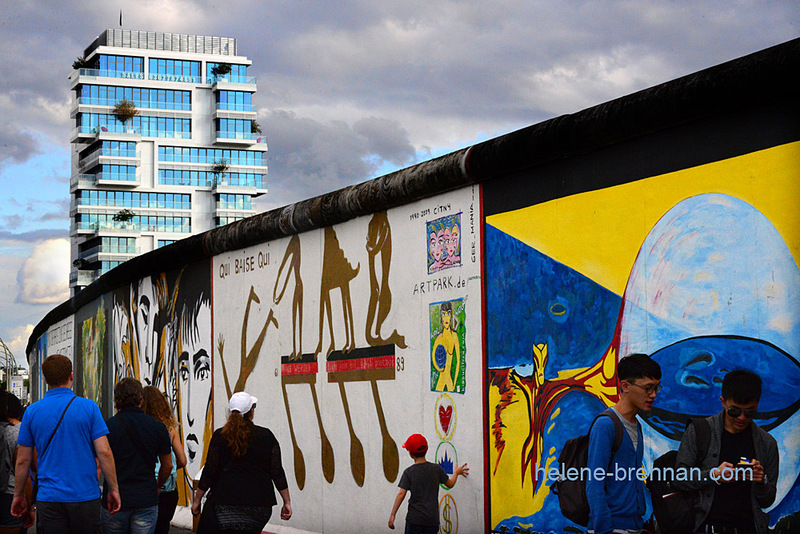 Berlin is awash with all sorts of creativity. 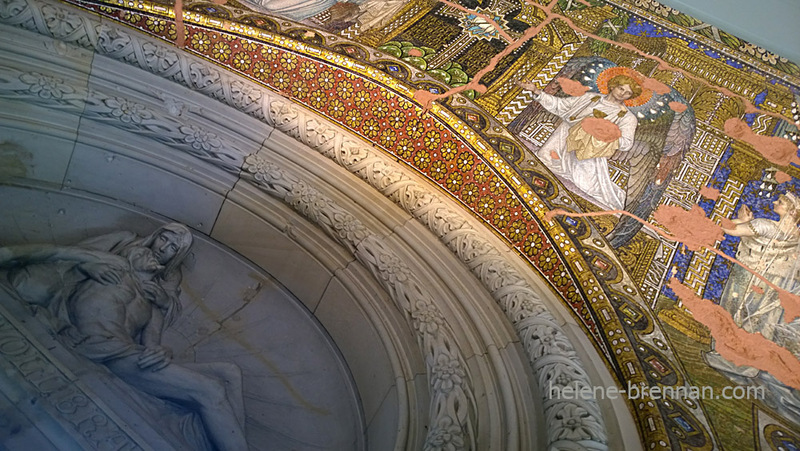 These photos show just a few of the images I captured in my opportunist moments as a tourist. I have little or no information about some of them, but they caught my attention. Below is a sculptural installation Rolling Horse on the northern terrace of the amazing Central Station. It was designed by the German sculptor Jürgen Goertz. The Oberbaum Bridge, above. It’s a double deck bridge that links Friedrichshain and Kreuzberg, boroughs that were divided by the Berlin Wall, and it has become an important symbol of Berlin’s unity. The photo below shows a train passing over the bridge. It’s 124 meters long. I have read that the design of the bridge has been credited to Santiago Calatrava and opened in 1896. But Santiago Calatrava wasn’t born until 1951 – so I’m confused about that! 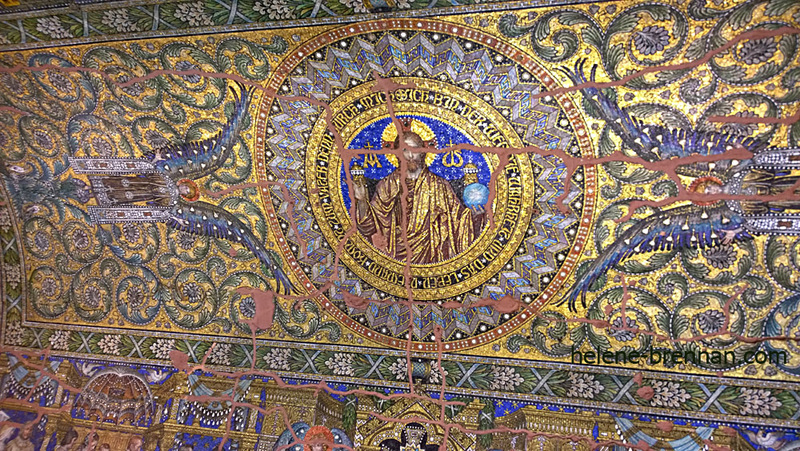 Above and below are two examples of several murals along Schloss Strasse, depicting events of history – on the way up to Charlottenburg Palace. 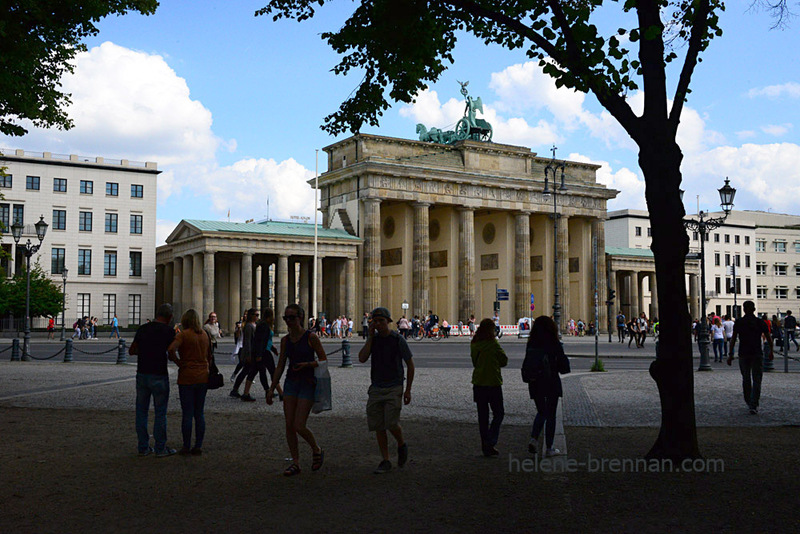 Below, the top of the Brandenburg Gate, as a more modern type of air transport passes above. I couldn’t let this colourful car pass without grabbing a shot. As for the one below – more fun than art, but I had to capture it. Several of them passed by, with grown up drivers. Below are photos of chance discoveries as I explored the city. Music by the River Spree, above. Graffiti, by the River Spree. There is a lot of graffiti in Berlin, some of it interesting and artful, but much of it is defacing other art objects, as in other examples shown in this post, above and below. 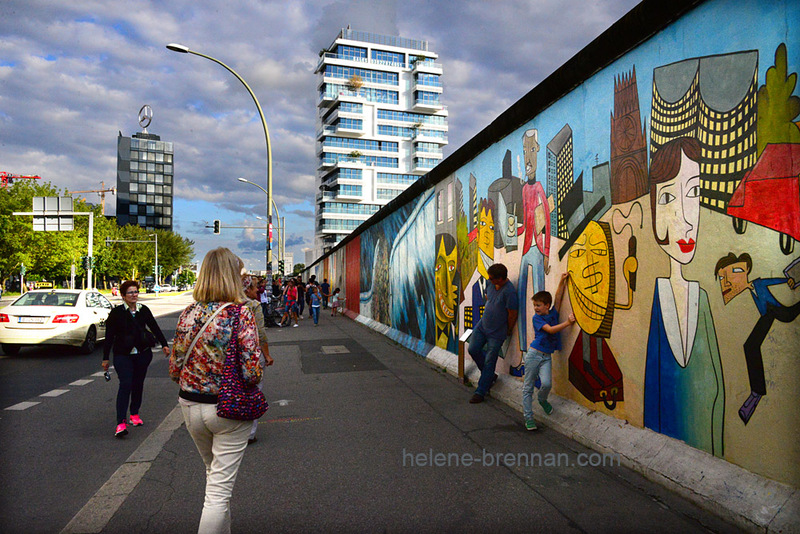 This one above and one below are examples of murals on the old Berlin Wall, or “The East Side Gallery”, as I have described in my first Berlin post. This one above appeared to be inviting people to make their own mark. Bubbles in Berlin, above; a little fun by the Brandenburg Gate. I really wanted to go up in this balloon, which would have given wonderful views of the city, but after queuing up for some time I was to be disappointed – out of service for some reason! I have several more photos, this is just a small section of them. I hope you have enjoyed looking at them. 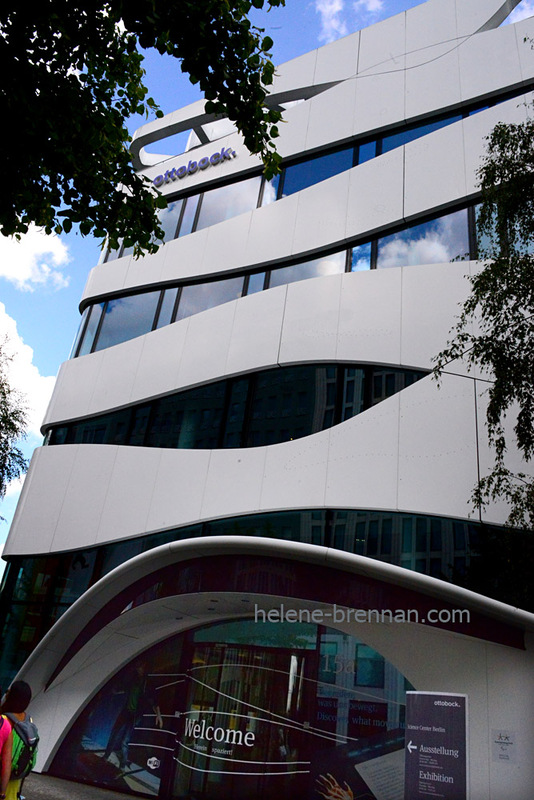 Here are some of my photos of those modern buildings which I encountered in my short time doing the tourist thing in Berlin. 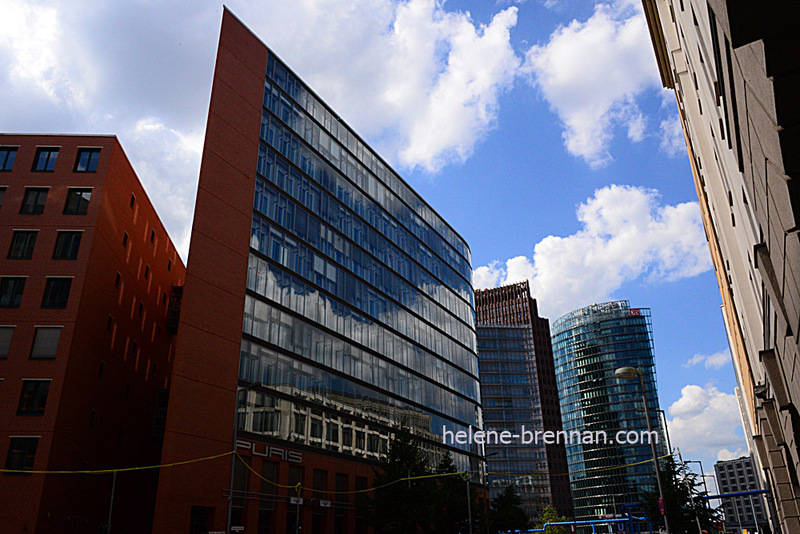 I know Berlin has many fantastic modern buildings, and I only saw a few, and grabbed some shots as I walked around. 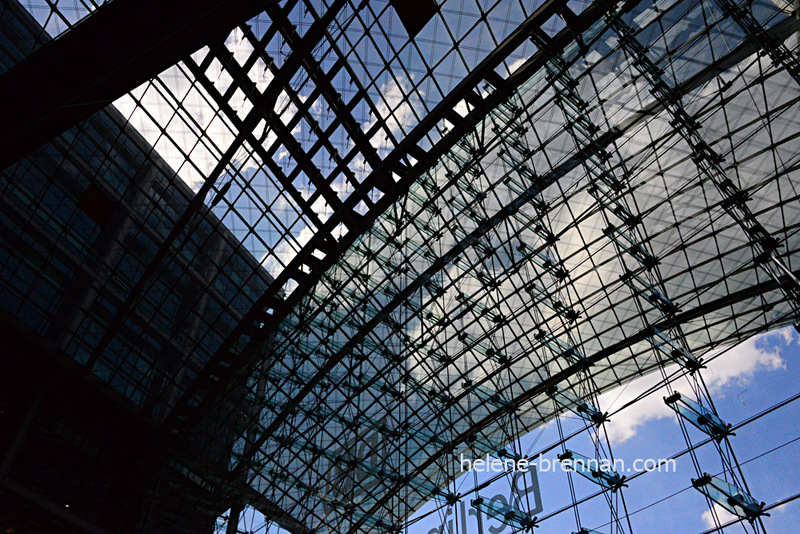 Modern buildings at Potsdamer Platz in Berlin above and below. The building on the left above intrigued me because it had a kind of perspective defying shape; it’s wider at the top! It was designed by Renzo Piano. 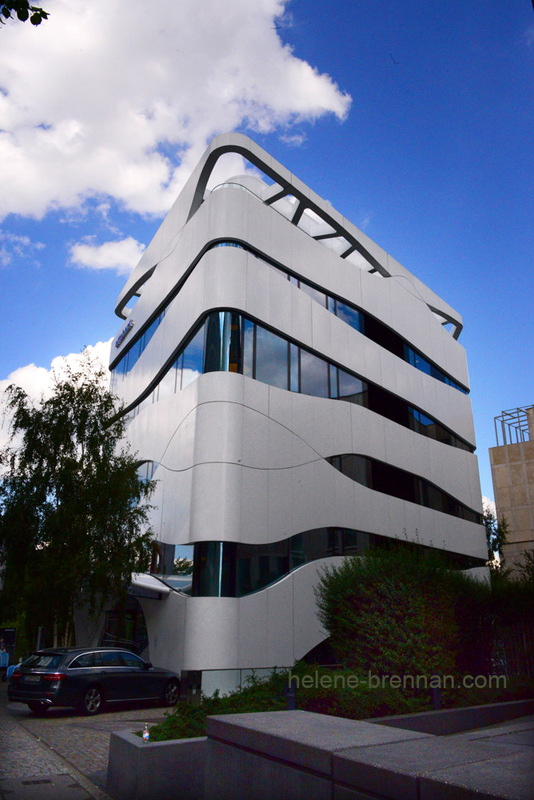 Below is the very eye-catching Ottobock Science Center for Medical Technology in Berlin. The design of the building, also known locally as the “muscle house” takes its inspiration from the design of the muscle fibres of the human body. 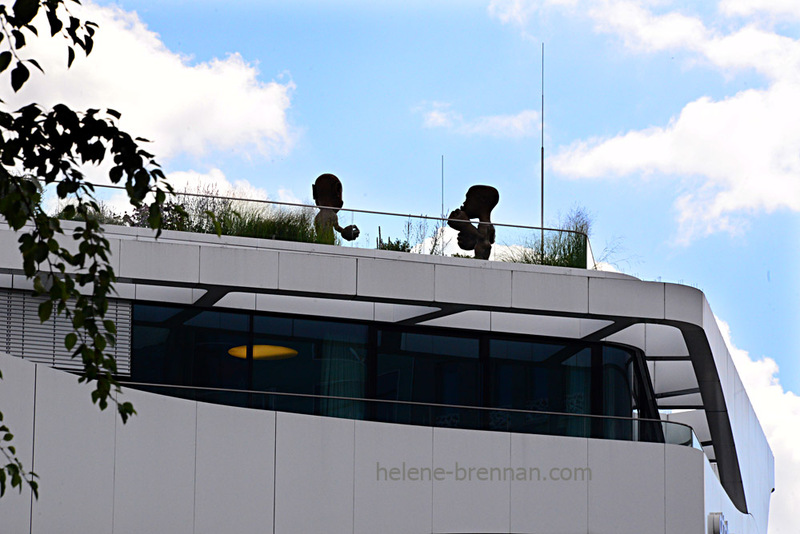 Looks like there is a lovely garden on the rooftop of the Medical Centre. 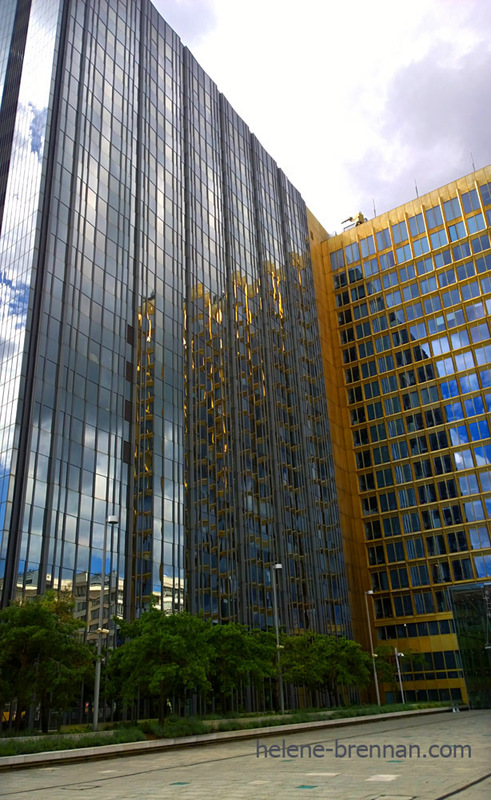 The two photos below are of the Axel Springer building. Axel Springer SE is the largest digital publishing house in Europe. 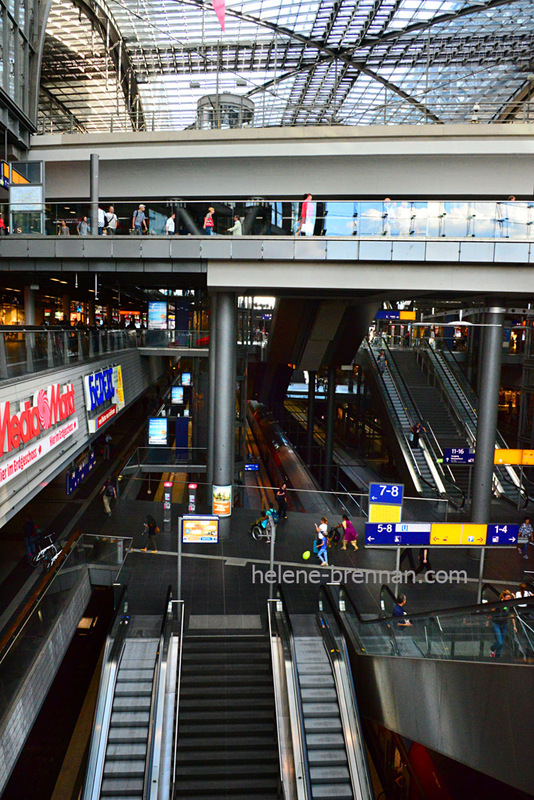 Central Station, below, or Hauptbahnhof. This is a marvelous feat of modern architecture and engineering. It also houses shops, restaurants and amazing self cleaning toilets. I didn’t get a picture of the outside of the building. 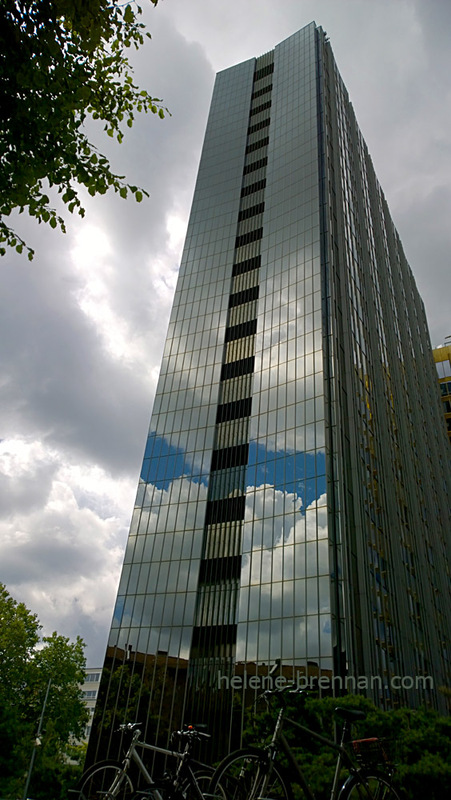 The building was designed by architect Meinhard von Gerkan and opened in 2006. Boxy buildings, below, yet not all looking the same. I find the patterns they make quite visually interesting. 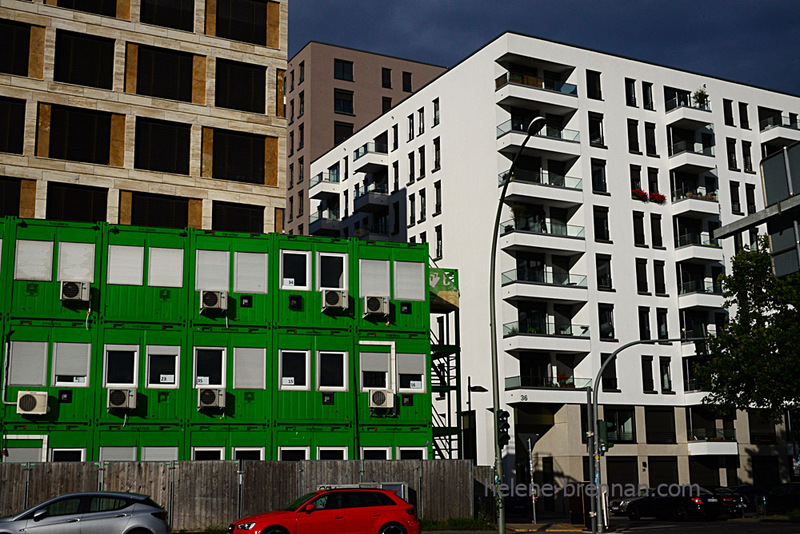 These buildings are across the road from some of the murals of the East Side Gallery, on the old Berlin Wall. 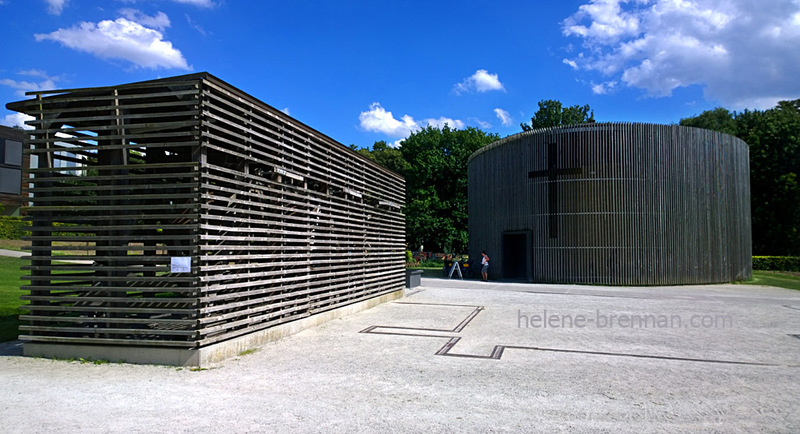 Below is the simple building of the Chapel of Reconciliation, designed by Berlin architects Rudolf Reitermann and Peter Sassenroth, which was built to replace the demolished original church building, that was located just on the east side of the Berlin Wall. It consists of an oval building and a rectangular bell house. 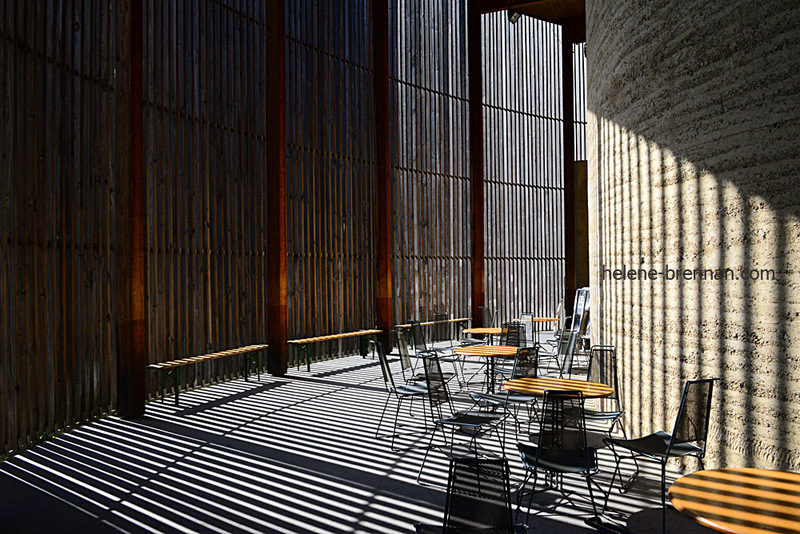 It’s more attractive features are perhaps best experienced inside; I particularly liked the corridor space between the outer and inner wall, with the sun shining through the vertical timbers, inspired, though minimalist. 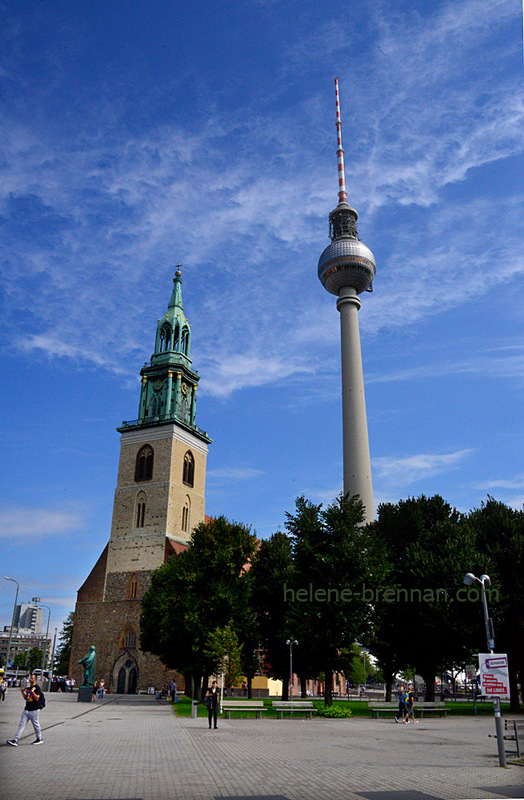 The TV Tower, or Fernsehturm, is in central Berlin, Germany. Close to Alexanderplatz in Berlin-Mitte, the tower was constructed between 1965 and 1969 by the government of the German Democratic Republic. It can be seen from many parts of the city. 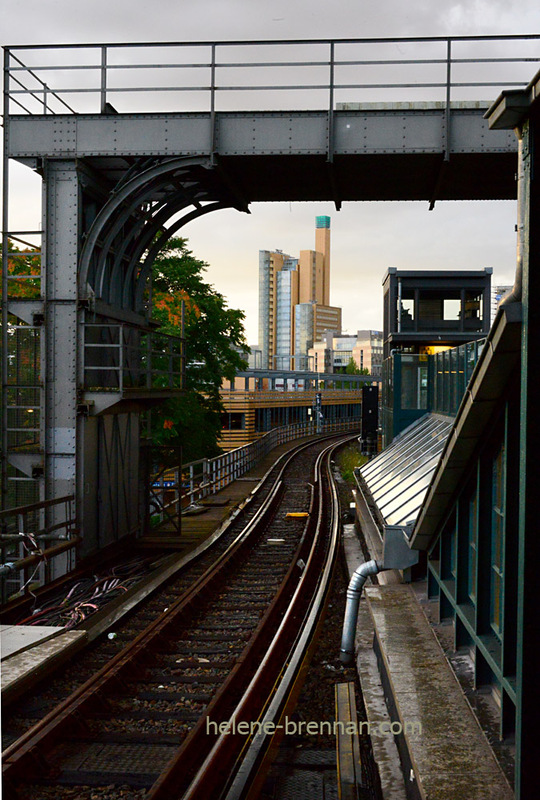 The original design of the magnificent tall Tower was devised by the GDR architect Hermann Henselmann. The sphere of the TV Tower was intended to remind people of the Soviet sputnik satellites and was to light up red, the colour of socialism. It was also specifically intended to have no religious significance or associations whatsoever, and it was a source of amusement to many that the sunlight on the sphere creates an image of a cross. The tower accommodates a revolving restaurant now, which turns hourly on its own axis, with spectacular views from 203 meters high. The church on the left is St. Mary’s Church. The two photos below were taken from Pankov Station, part of the underground system. 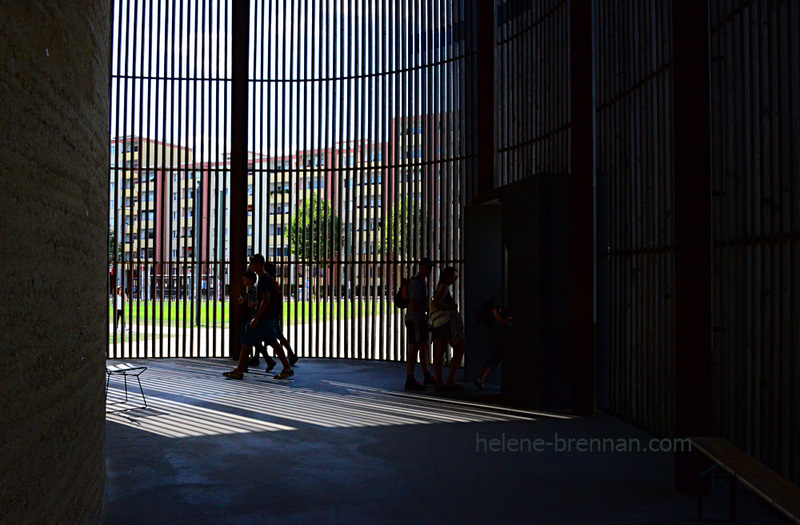 The above structure has been built on the site of part of an excavation of the old Gestapo Headquarters that exposed a number of subterranean solitary confinement cells and interrogation chambers. 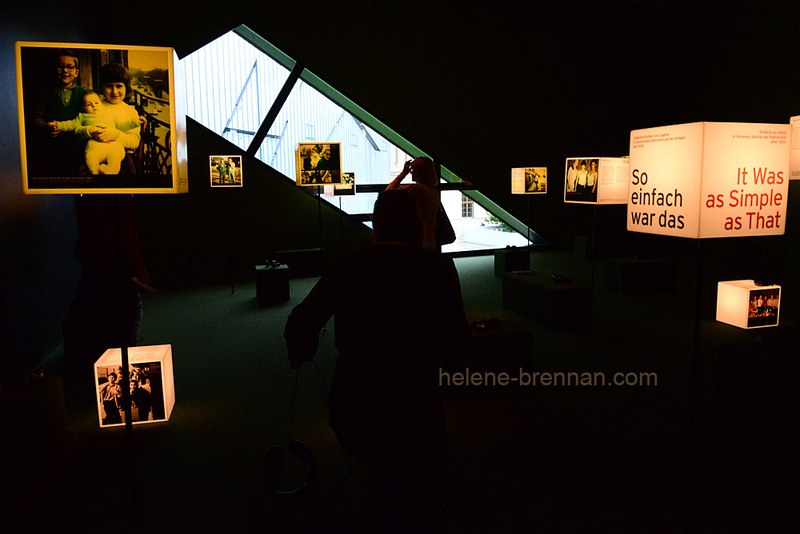 Now it is used for an exhibition of photos and information. 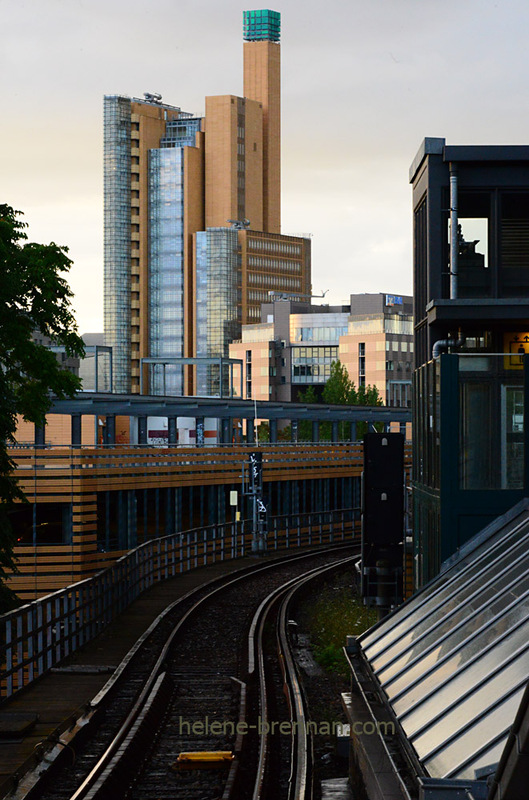 Below is a photo that shows the roof of that structure, with reflections on it of the buildings around. 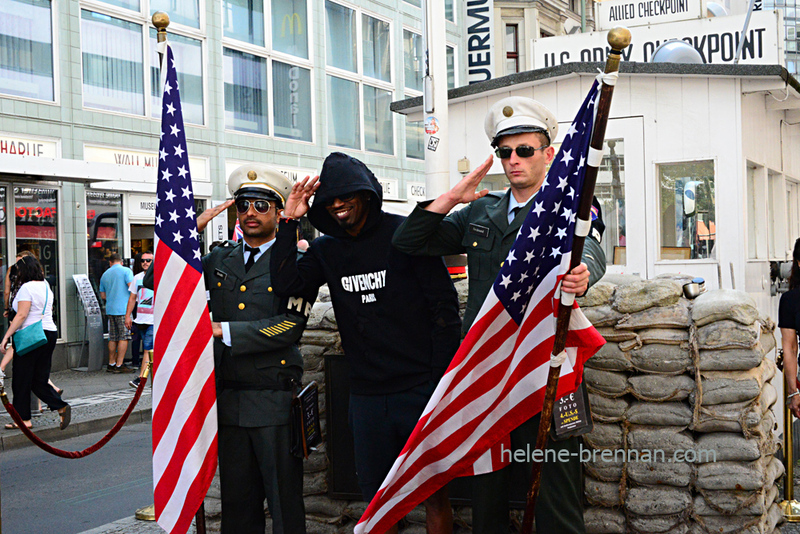 Looking across from Checkpoint Charlie (above), showing some of the many tourists who flock to the landmark. Behind the camera is a replica of the unit that checked people travelling from West to East. East to West would not normally have been permitted. 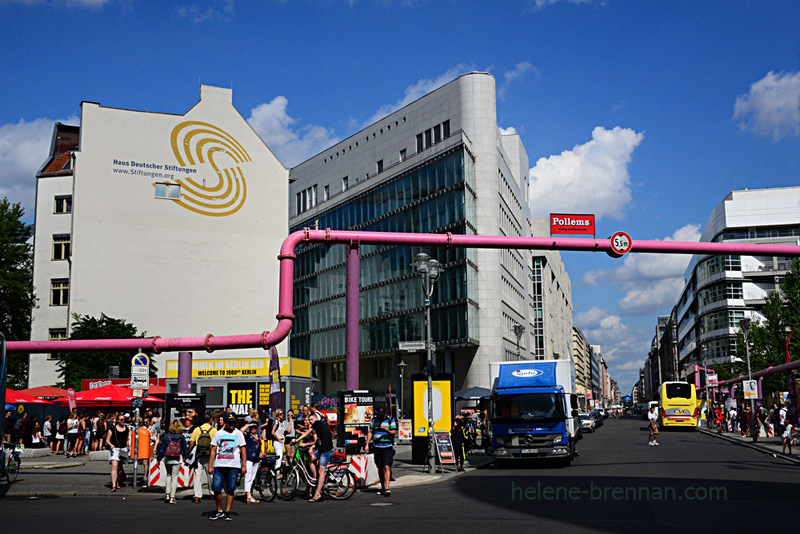 The colourful pipes in the picture are everywhere and are used for drainage from the many building sites currently in the city. Love them or hate them, they get in the way of photography, and one has to simply try to incorporate them creatively into the photos. Another example of those pipes shown below. 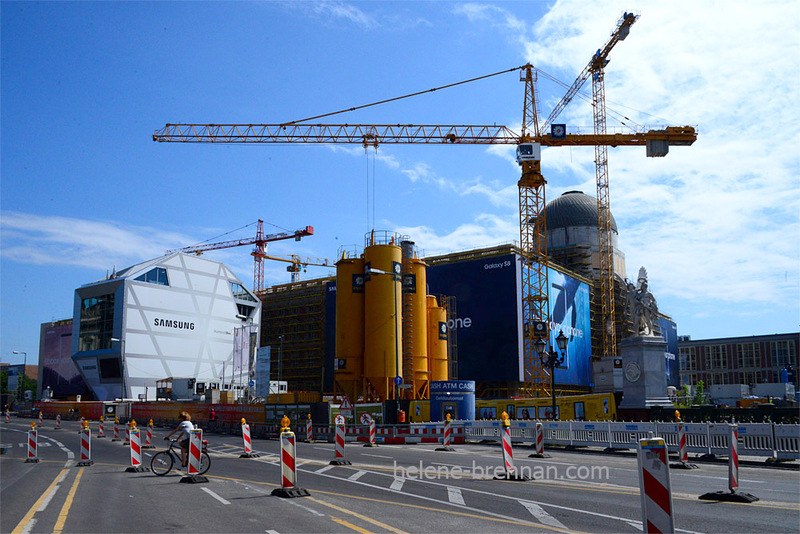 The rebuilding of the Berlin Palace, above, located on Museum Island. The original Palace was destroyed by the East German communist regime in the 1950s. Completion is expected in 2018. Thanks for visiting my blog. More on Berlin to follow. 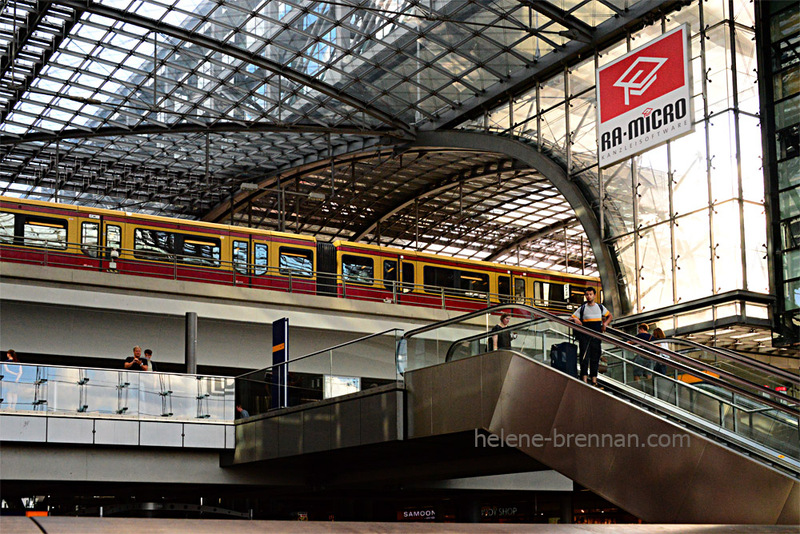 Please also take a look at my website for more photos of Berlin. All photos are for sale. In my short time in Berlin I couldn’t possibly have photographed all the interesting buildings in the City, indeed there were many amazing places I didn’t see at all. It was just a case of typical tourist sightseeing while taking as many photos of whatever caught my attention. In this post I have been struggling to decide which buildings to show but finally I’ve decided to just show a number of photos of one particular building. More will follow in future posts. 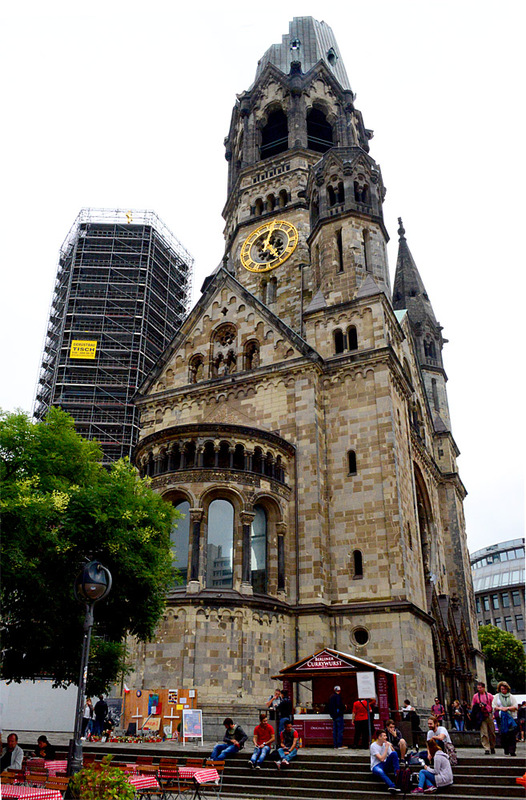 This is the Kaiser Wilhelm Memorial Church. 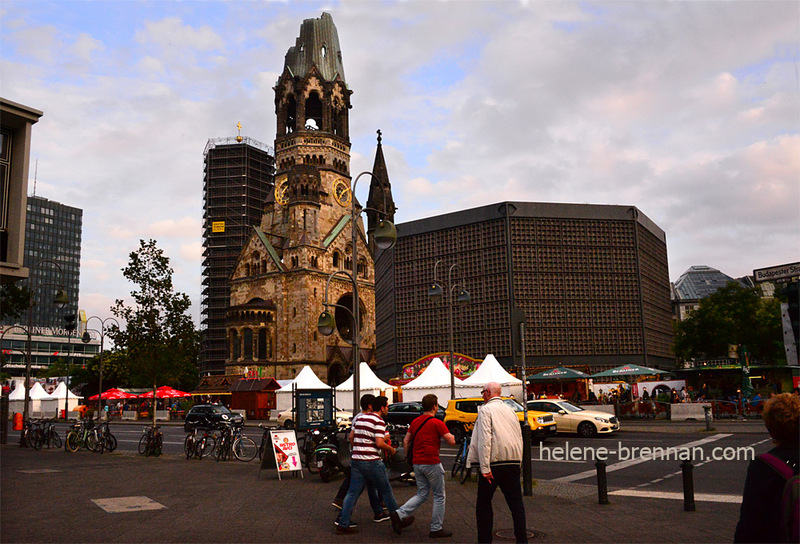 It is one of the most famous and very popular landmark in Berlin. It was first built in the 1890s but it was bomb damaged in an air raid in 1943, and much of it was destroyed. However, some has survived, and has been repaired and maintained as a memorial and symbol of reconciliation and a very busy tourist attraction. Also the Church was rebuilt in the form of a number of new modern buildings, between 1959 and 1961, in a totally different style to the original. This is the old Church with its damaged spire (above) and the tall building on the left which is one of the new additions. 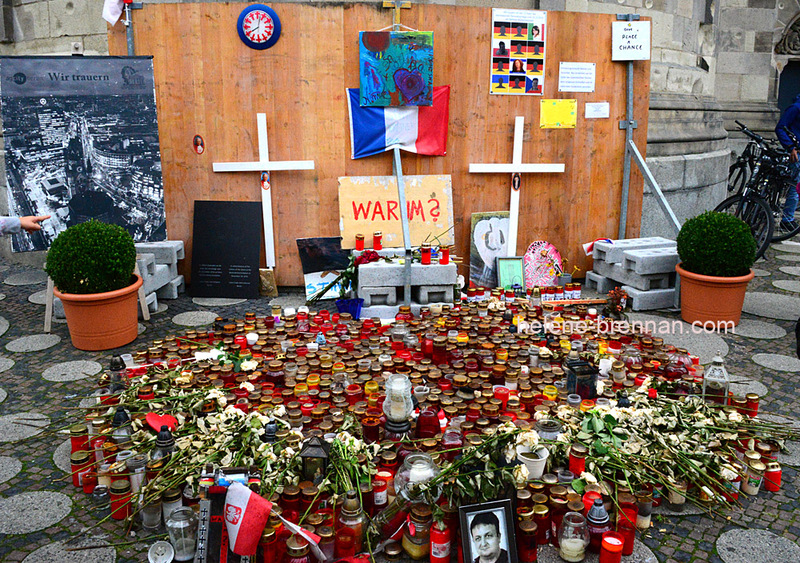 On the left of the picture above (also below), you can see the shrine that has been set up to remember the victims of the terrorist attack at this site last December, when a truck was driven into the crowd at a Christmas Market. 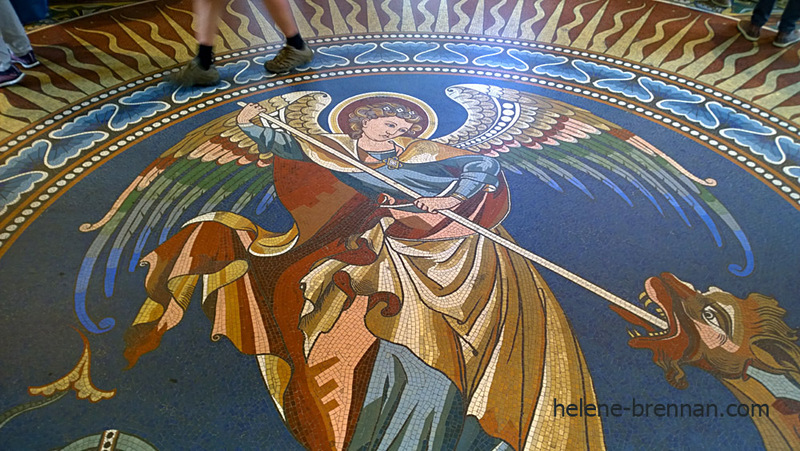 The photos below show the inside of the old building, with the wonderfully ornate ceiling, walls and the beautiful mosaic floor. The photo below shows the new building for worship, on the right. 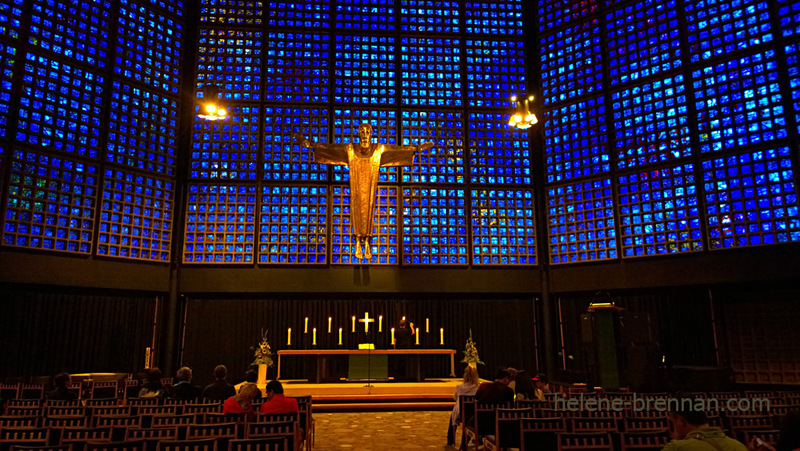 It was designed by architect Egon Eiermann with very striking stained glass walls designed by Gabriel Loire. Perhaps it’s not so attractive on the outside, but on the inside it’s quite beautiful, and although I’m not religious I found the predominantly blue stained glass creating a perfect calm and contemplative environment. 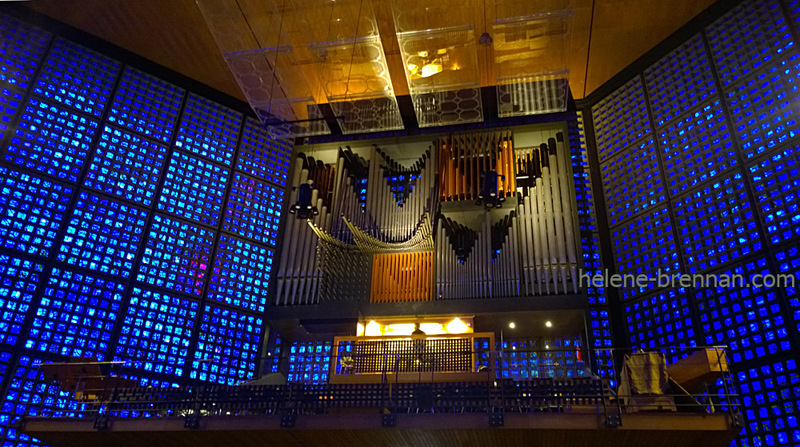 Opposite the altar on a gallery is an organ containing about 5,000 pipes (above), which was built by Karl Schuke. Plexiglas panels have been installed over the organ gallery to improve the acoustics. I was lucky enough to hear the organ playing, you can see a person seated at it in the above photo. I also very much enjoyed a concert of classical music here one evening, performed by the Berlin Chamber Orchestra. 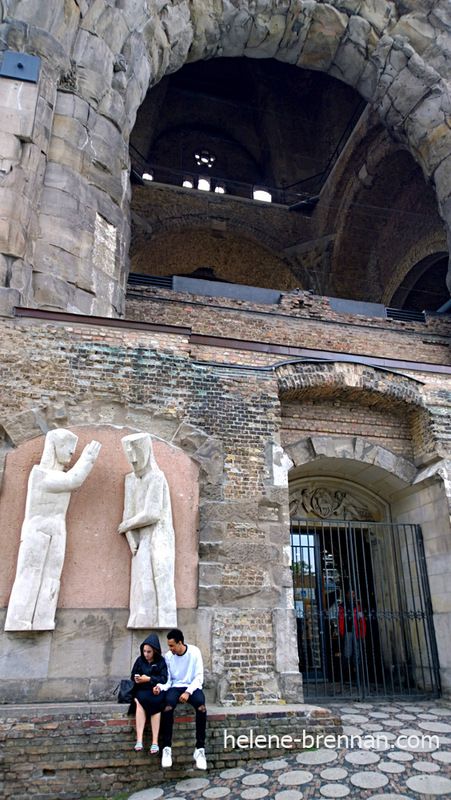 A couple of tourists inspect their photos under two modern sculptures outside the old tower. 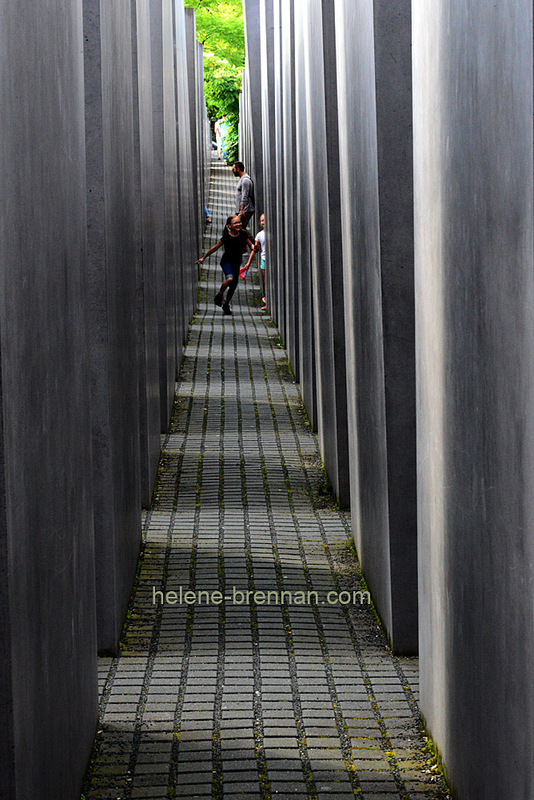 I hope to post more photos of Berlin shortly. 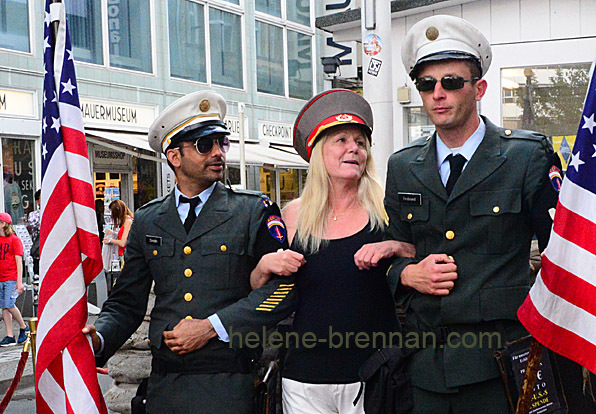 Please visit my website, which has several photos of Berlin. All photos are for sale. Thank you for viewing my post. 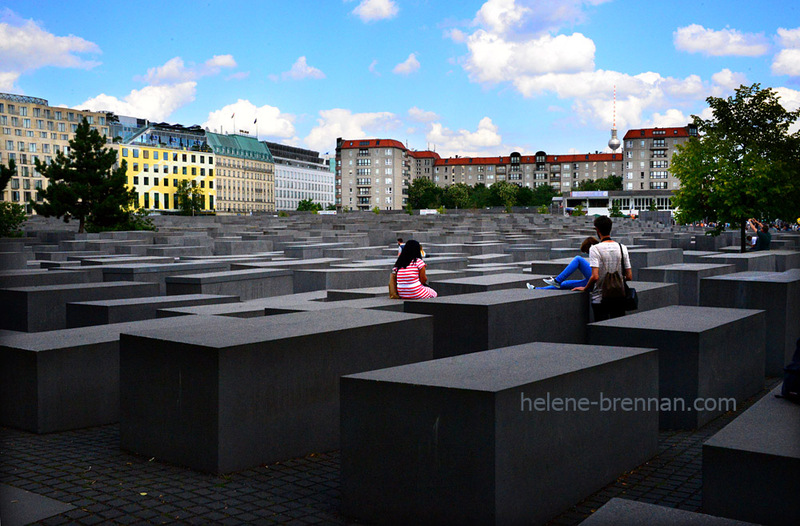 I was recently a tourist in Berlin for just a week. Of course I took hundreds of photos, as I always do, and as all tourists do. 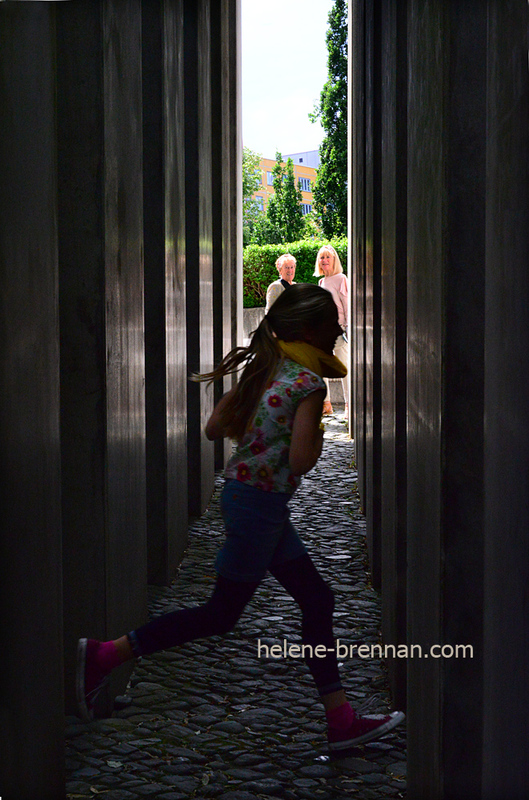 This, my first post on the Berlin topic is focusing on some of Berlin’s numerous memorials, museums and other history related installations that remember with courageous honesty, the stories of terrible events that destroyed so many lives, particularly in the early 20th century. 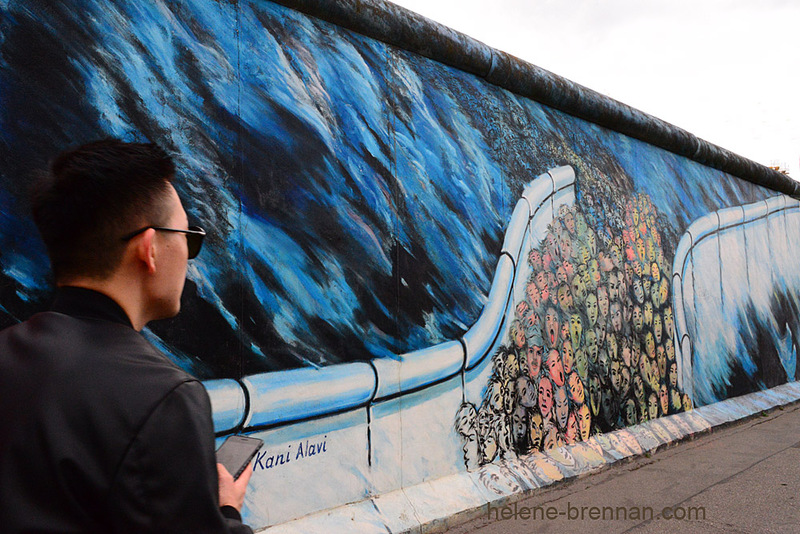 Below are some photos showing images from Berlin’s East Side Gallery. 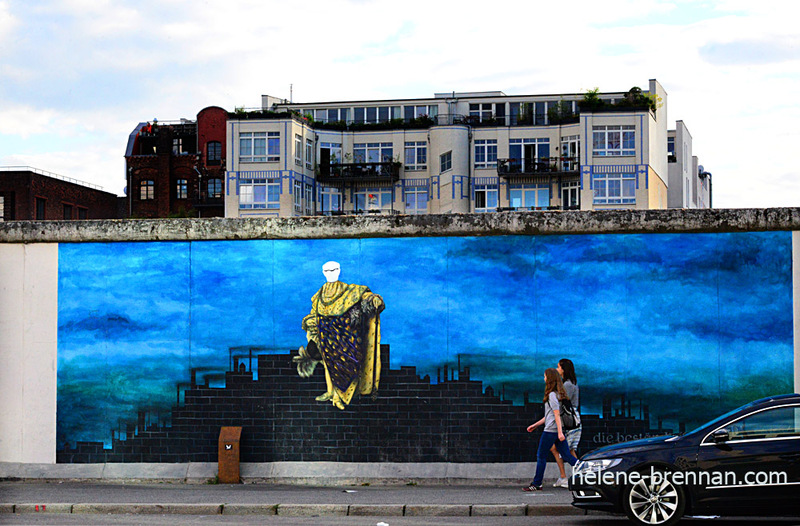 After the collapse of the Berlin Wall, a long section of the remainder of the structure was utilised as a surface for murals of artists from all over the world. Millions of tourists pass this way every year, to remember, to take photos, to take selfies, to hope for the future. 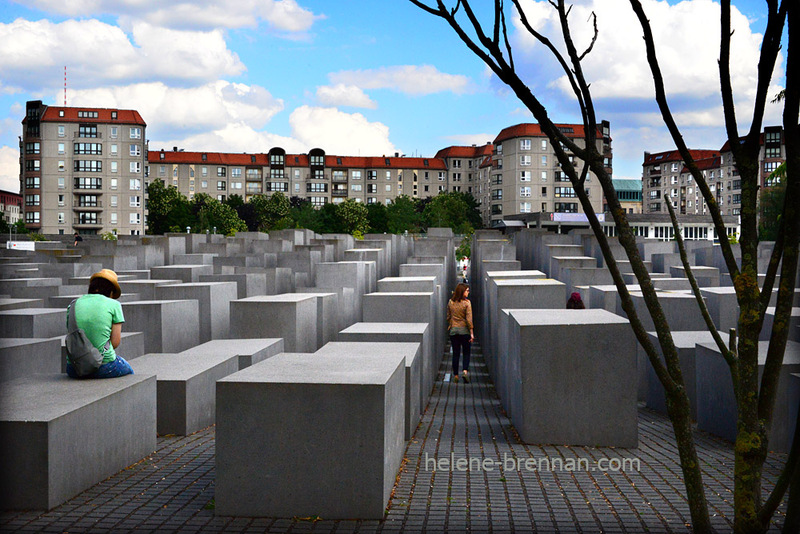 Above is the Holocaust Memorial, designed by New York Architect Peter Eisenman. The site covers 19,000 square meter’s, with 2711 concrete slabs, set on a slightly sloping and uneven site. There is also has an information centre underground. 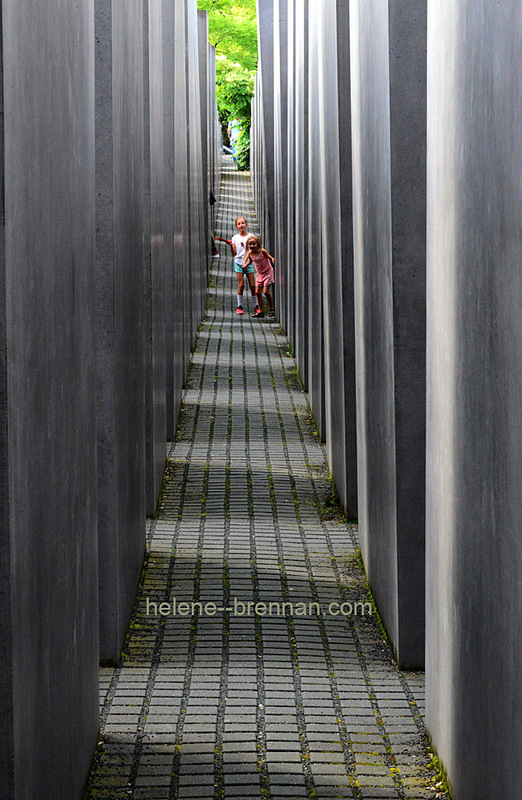 Adults wander, reflect and contemplate, while children do what children do and generally play hide and seek around the slabs. The Jewish museum, above, is a very innovative building with an unusual zigzag shape when seen from above, and it has narrow diagonal windows. 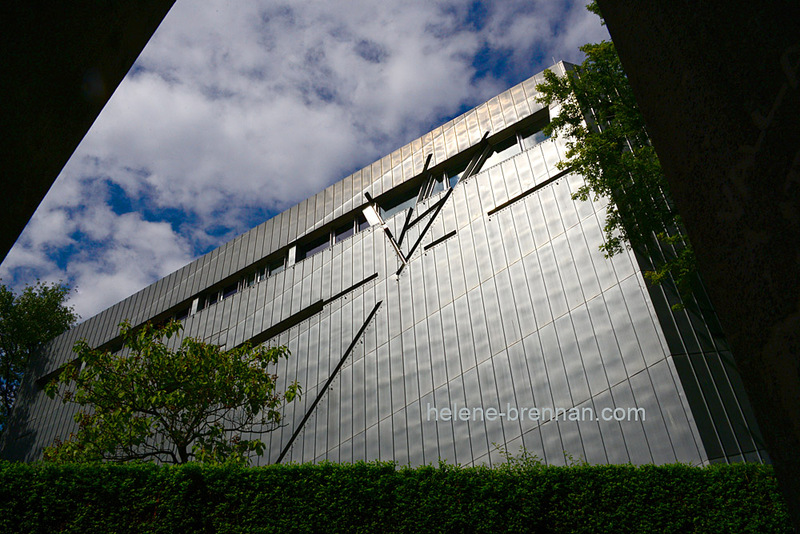 It was designed by Daniel Libeskind. 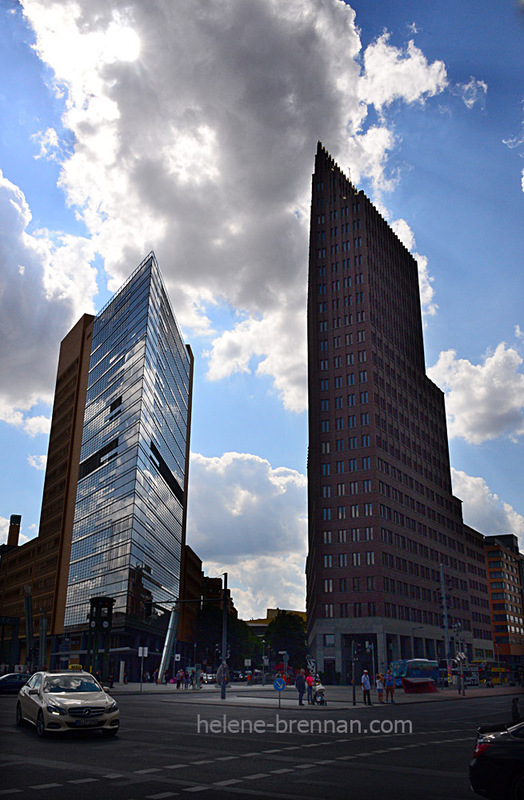 More information about the building can be found on https://www.jmberlin.de/en/libeskind-building. The photo below shows a room inside the building. Outside, at the museum there is a Garden of Exile and Emigration, which is reminiscent of the Holocaust Memorial, and where children also play enthusiastically, and perhaps inappropriately. 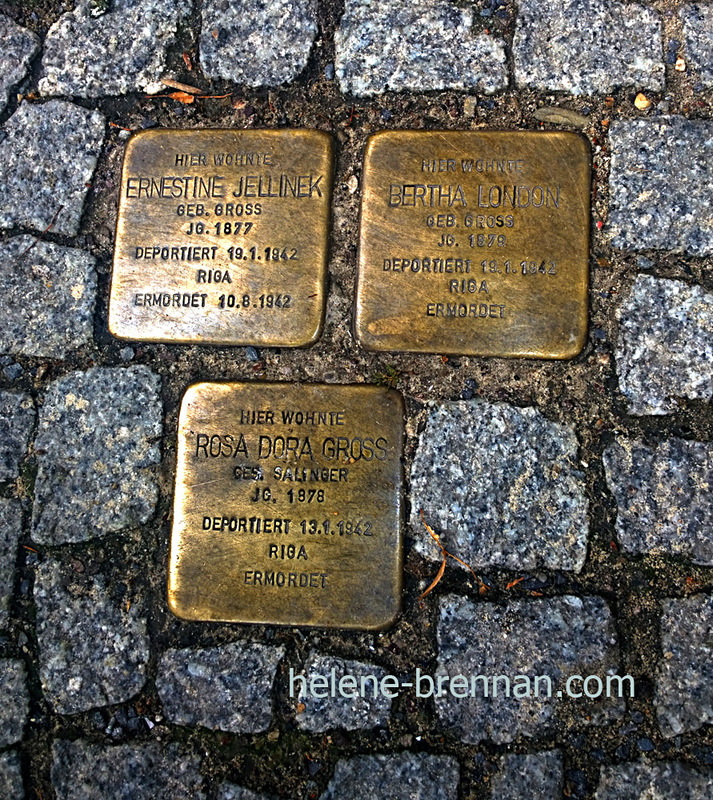 The brass tiles (Stolperstein) that can be seen embedded into the pavements all over Berlin each remember the name and life dates of a Jewish person who lived or worked in the adjacent house before falling victim to Nazi Extermination or persecution. This inspirational Stolperstein art project was initiated by the German artist Gunter Demnig in 1992, and is still ongoing. 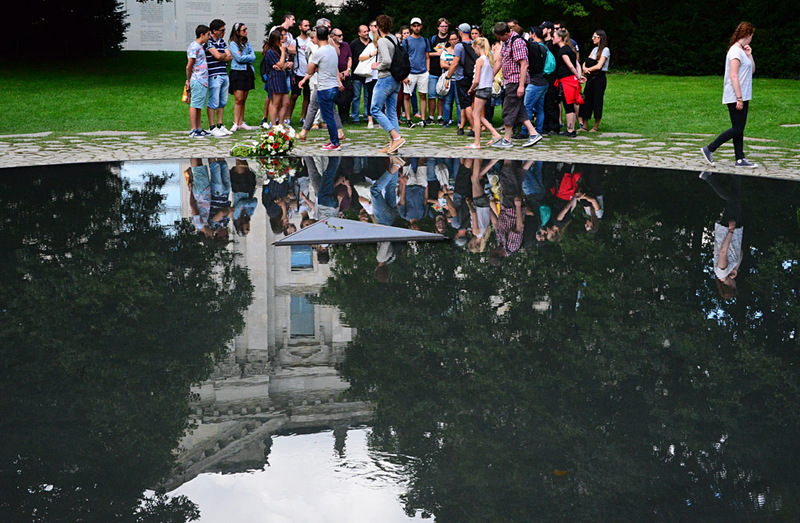 Pondering and reflecting at the Sinti Memorial (above). This was constructed to remember the ethnic cleansing at the hands of the Nazis, of some 220,000 – 500,000 Sinti and Roma people. It’s a beautiful tranquil memorial designed by the Israeli artist Dani Karavan. 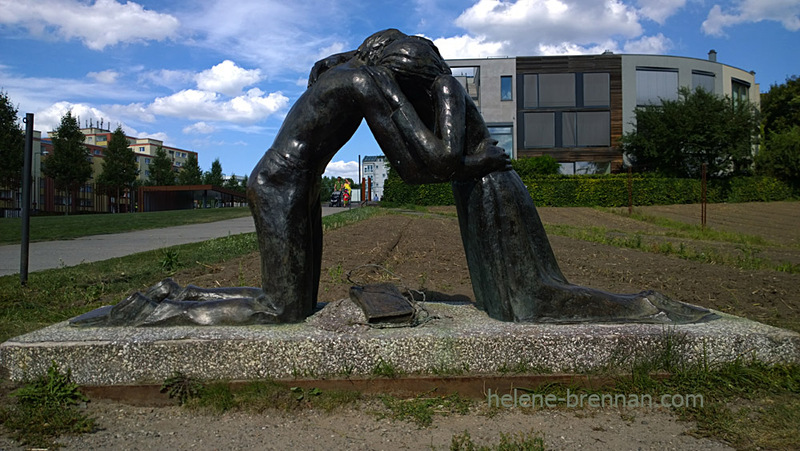 This sculpture, “Reconciliation” was created by Josefina de Vasconcellos following the devastation of the Second World War. It is located at the modern Chapel of Reconciliation, which replaces the original structure. There are copies of this sculpture at Coventry Cathedral, in the Hiroshima Peace Museum, and in the former border strip at the Berlin Wall. 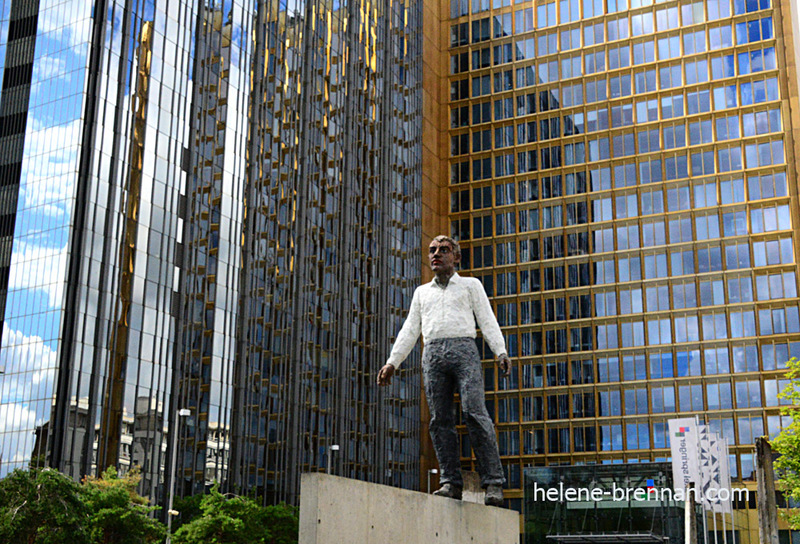 The sculpture above, “Balancing Act” at the Axel Springer Building was created to commemorate 50 years after the laying of the foundation stone for the building, and 20 years after the fall of the Berlin Wall. Stephan Balkenhol was the sculptor. Axel Springer SE is the largest digital publishing house in Europe. 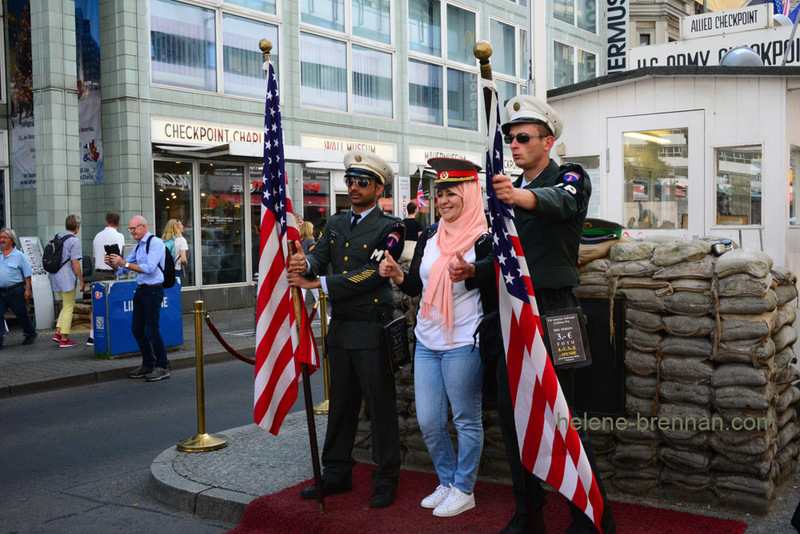 Below is the famous landmark Checkpoint Charlie, the best known checkpoint between East and West Germany, before the collapse of the Berlin Wall. 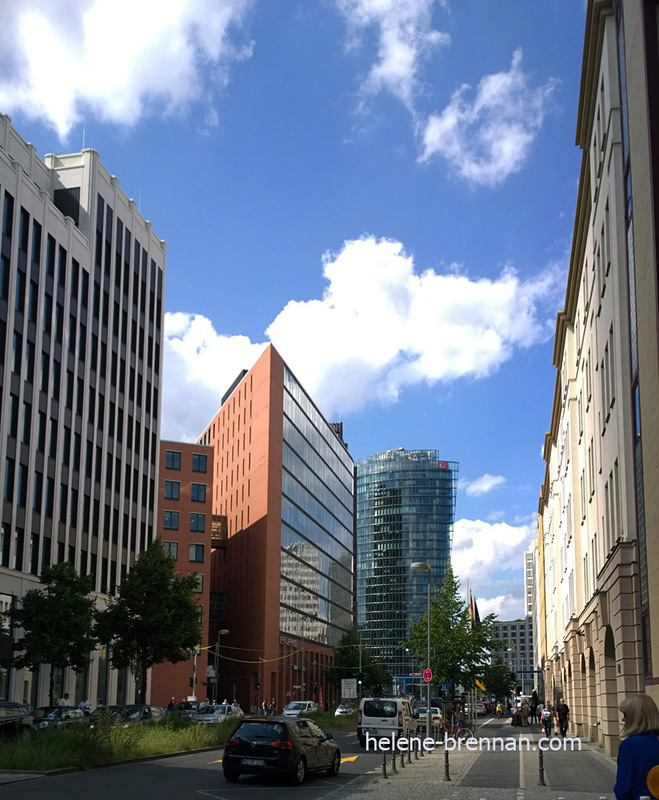 It is located on the corner of Friedrichstrasse and Zimmerstrasse. Now a major tourist attraction, thousands, if not millions of tourists flock to see this place and have their photos taken with the ‘guards’ who will charge €3 for the privilege. The hut is a replica of the original which is now on display at The Allied Museum in Berlin. Looks like she found her man in uniform! Below is the famous Brandenburg Gate, an 18th-century neoclassical monument in Berlin, built on the orders of the Prussian King Friedrich Wilhelm II. 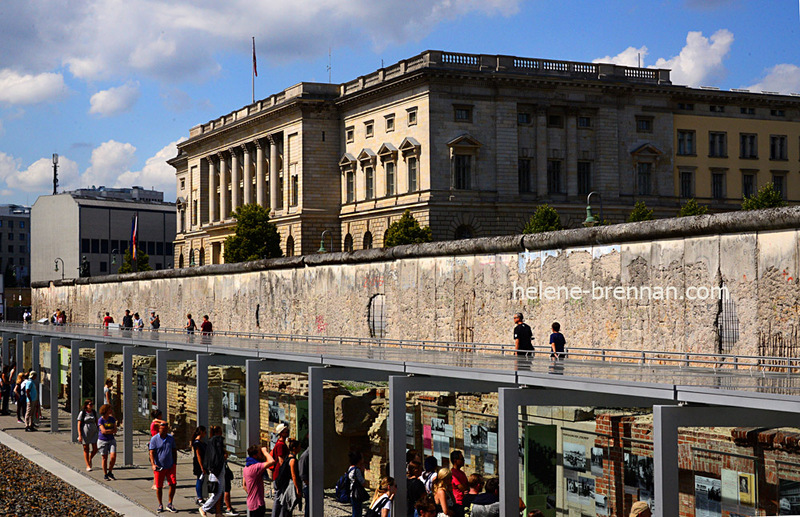 When the Berlin Wall was built in 1961, the gate became part of the wall between East and West, and it was closed. 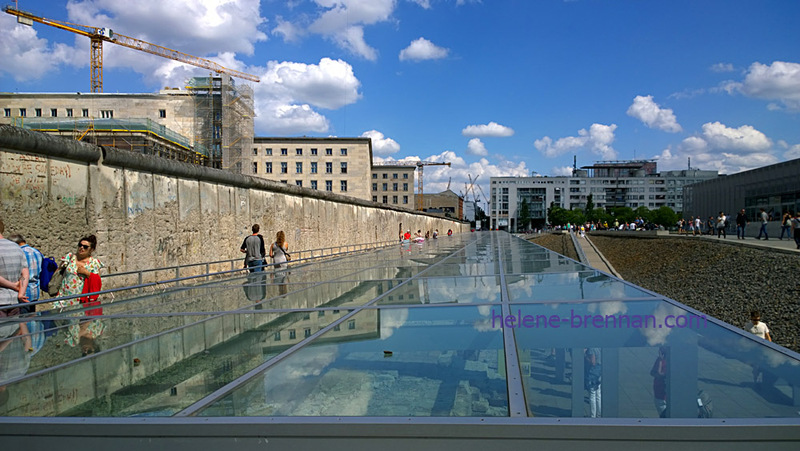 Now a major tourist attraction and a symbol of freedom for many Germans. Thanks for looking at my first post on Berlin. I hope to post more on this city shortly, which will focus on some of the many interesting buildings in the city. Please come back.